Nestled within 7,000+ acres of fertile, high country ranch land and dramatic Rocky Mountain peaks, is the most extraordinary mountain community in North America. Cordillera has four unique neighborhoods spanning from "The Valley" floor to "The Summit" peaks, four world-class golf courses and a luxurious Lodge & Spa. 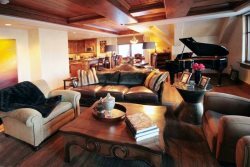 Located 20 miles from the Vail/Eagle County Regional Airport, less than two hours from the mile high city of Denver and minutes from the legendary ski resorts of Vail and Beaver Creek. Cordillera is the epitome of casual, mountain living with a twist of refinement. Large formal dining room, Private hot tub with mountain views, Cable TV, DVD players, Vonage and WIFI, 2 Car Garage, Deer or Fox playing in the yard guaranteed!